For every East Village business that’s opening or closing, dozens are quietly making it. Here’s one of them: Igor’s Clean Cuts. Shira Levine Igor Iskiyev tends to a customer while Imanuel (Manny) Ibragimov looks on. Five years ago Igor Iskiyev left his gig cutting hair at Neighborhood Barber on East Ninth Street and became commissar of his own chop shop at 20 First Avenue. The Azerbaijan native had dabbled with hair-cutting back home after serving as an anti-aircraft gunman. Igor’s reputation for detail and perfection precedes him: good Yelp reviews, affordable prices ($15 for a haircut, $15 for a shave) and, let’s face it, the occasional offer of a beer have been key to his success. The Local recently spoke with Mr. Iskiyev and his right-hand man, Imanuel (Manny) Ibragimov about Mr. Iskiyev’s decision to go solo and his distaste for small talk. Helen Zhang Alx Alvarez is a stylist at Salon 13, at 212 Avenue B, one of several salons in the East Village that offers customers wine or beer while they wait. I am finally sitting in the hairdresser’s chair, after nervously picking off most of my blue nail polish. My anxiety has been building for about two days since I made my annual appointment to cut my tailbone-length locks. In the past too many too-generous inches were chopped off without warning, so it’s hard to keep my cool once those pointed scissors come at me. 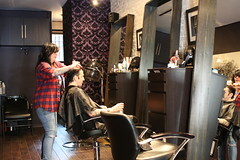 But stylist Alx Alvarez at Salon 13, at 212 Avenue B, assures me that she had been cutting hair for 20 years, styling the likes of Tommy Lee and Kate Hudson. Despite the fact that she was slugging down a 40 of Yuengling beer, I decided to trust her. To help me relax, she offered me a Coors Light.